So while I’m in the midst of juggling many different things, I wanted to leave you with these awesome muffins. I start my days out early and usually by ten I’m hungry. While I usually try for fruit or nuts, sometimes I like to take a coffee time-out and enjoy of muffin or scone. I love the coconut/blackberry combo and if you have a good egg substitute, these muffins could be easily vegan! Preheat oven to 375˚ and prepare a 12-muffin pan. Using the food processor, pulse oats until resembles a coarse flour. Pour into a medium bowl and combine with pastry flour, baking powder, and salt. In a separate bowl whisk together coconut oil, eggs, maple syrup, and 3/4 cup coconut milk. Add more coconut milk if consistency is too dry and resembles more of a dough than batter. 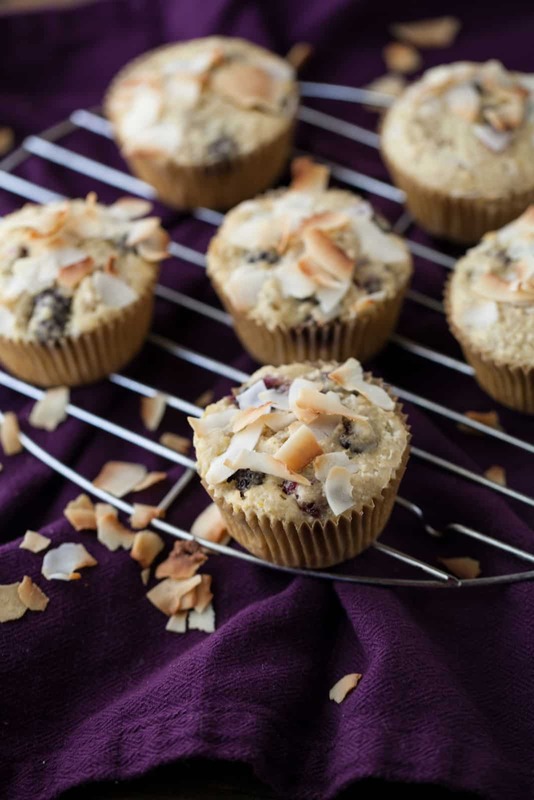 Evenly scoop in to muffin tin and sprinkle with coconut flakes. Bake until muffin springs back and is starting to golden, 18-20 minutes. Love that these use maple syrup! 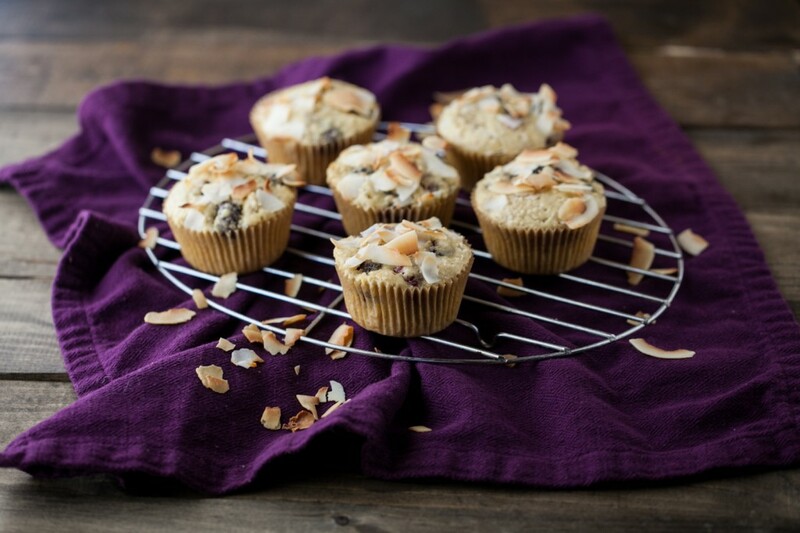 I’m always on the hunt for recipes for baked goods that use natural sweeteners. Yay for vacation time! Thank you for delivering a recipe with ALL whole wheat/whole grain flour. I get so frustrated with recipes that only use white or a mix of both. When we create recipes like this, we are going back to the basics and showing the world we really don’t need all that refined stuff. Thanks so much! I can’t wait to try these! I have seen coconut milk in both a carton and a CAN. What is the purpose for using either one? This is something I’ve always wondered! could you use regular whole wheat flour instead of whole wheat pastry flour? Yes, the muffin might end up just a tiny bit more dense. I made these yesterday… I am pretty sure I have to make another batch today! SO fantastic! I just made these, they turned out great – and I’m a terrible baker. They don’t have the chewy, unpleasant texture you normally get when you bake cakes with wholewheat flour. 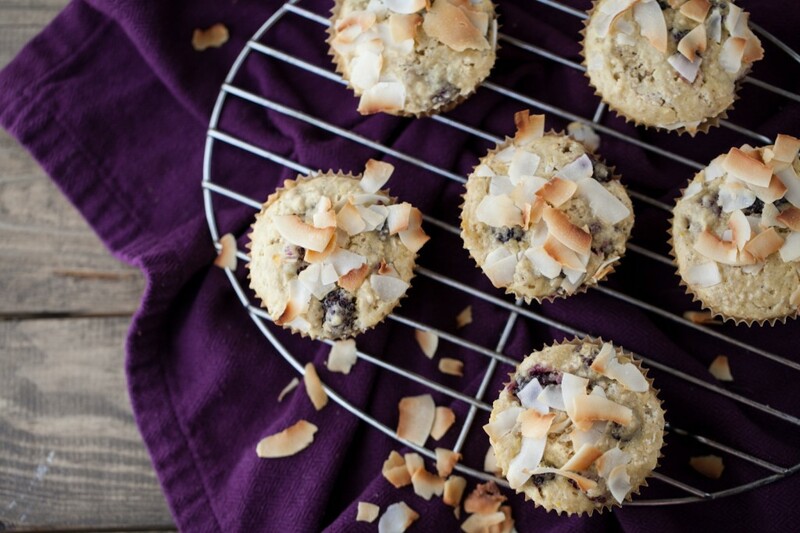 I only had frozen blueberries & didn’t have quite enough – the muffins with more fruit in them def. tasted better so it pays to be generous here. The flavorless coconut oil I used gave them a rich buttery flavor too. thanks a lot for the recipe.